Kocher+Beck’s magnetic die technology can be deployed in all areas, including in-mould applications, at a service level and quality that will impress you. All die ranges are Nickle coated to avoid and stop rust build up on all dies supplied. Our varsity AI Universal flexible die is suitable for all types of self-adhesive and single-material products. AI Universal is suitable for all jobs involving kiss cutting and cutting down to the anvil. They are CNC sharpened and feature smooth polished cutting edges obtained using an ultra-fine edge polishing technique. Benefiting from the extended service life of the die, this is between 2 and 3 times longer than the life of a conventional die. This is achieved by hardening levels of 65-68 HRC due to the laser hardening technology. 3L Laser Long Life can be used for the same purposes as AI quality dies. This flexible die features a special adhesive-repellent surface coating. This tried and tested product has proven to be the ideal solution for emerging adhesive bleed or blocked labels. Nanotec dies are suitable for all jobs and have an extended service life of 5 to 7 times longer than your standard conventional die. GapMaster the world‘s leader for adjustable anvil systems, used to adjust the gap between the anvil body and the magnetic or cutting cylinder in ultra-precise steps, even when the machine is running. It produces perfect results, even with the thinnest substrates. Allows adjustments to one or both sides of the air gap to compensate for uneven die wear. With amazing gap setting precision at 0.8 micron intervals. Change backing materials without changing the cutter. 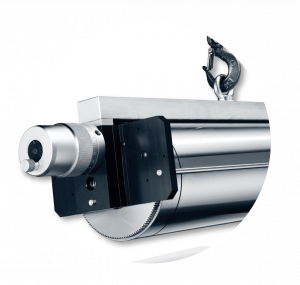 Praxair is a leader in wear-resistant Anilox Rollers for optimised ink application in flexo printing, our high-quality ceramic coatings and stringent quality controls are second to none. The performance of a laser engraved ceramic anilox roll begins with the coating. Praxair’s exclusive LC4 roll coating, made of 99 percent pure chrome oxide, sets the standard in bond strength and density. The coating also maintains an average hardness of 1300 Vickers, making it one of the hardest in the industry. These characteristics ensure that our anilox rollers will run on-press longer, without the need for repair or replacement. Praxair takes extensive measures to ensure precision throughout the engraving process. Having the proper cell volume is absolutely necessary to accurate colour reproduction. We can produce consistent cell volume because we use the latest process measurement technologies. Praxair is able to not only engrave standard 60°, 45°, and 30° cell engraving but has also developed a range of engravings for superior ink delivery, such as ISF which greatly reduces ink spitting during production.